All types of wetlands are carbon sequestering systems (aka “carbon sinks”), from temperate freshwater wetlands to boreal peatlands. That means that wetlands have the ability to store excess carbon (via photosynthesis) from the atmosphere – one of the primary components of greenhouse gases and a driver of climate change. Drainage and degradation of wetlands can release significant amounts of this stored carbon back into the atmosphere in the form of methane and reduce the ability of wetlands to sequester additional carbon. 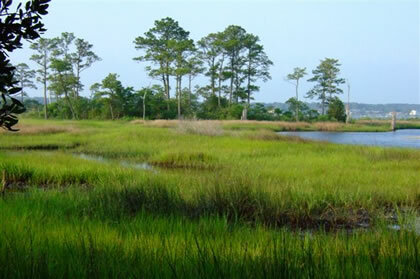 Better management practices can help protect these stores of carbon and the ability of wetlands to sequester it. “Blue carbon” is the type of carbon that is stored by coastal wetland vegetation such as mangroves, seagrasses and salt marsh grasses. Terrestrial wetland soils also function as carbon sinks and can store carbon produced by upland agriculture, forestry and other land uses. As carbon, in the form of organic material (such as eroded soil, leaves, and tree debris), is washed into low lying wetland areas, it is deposited into wetlands where it becomes part of the wetland sediment through decomposition or burial.